follow the parallel instructions to pay with credit/debit card. On November 30, 1864, 100 regiments of the South's best soldiers, 20,000 men in all, deployed along a two-mile-wide front and began a spectacular converging assault upon 17,000 Federals strongly entrenched on the southern edge of the small town of Franklin, Tennessee. What occurred over the next five hours at Franklin was one the great cataclysmic tragedies of the American Civil War. For the size of the forces engaged and the short duration of the fighting, the Battle of Franklin ranks among the great blood baths of the Civil War, or of any other American war. This horrific battering of the Confederate Army of Tennessee at Franklin and its near-disintegration two weeks later after the Battle of Nashville essentially ended the war in the Western Theater. Yet despite its significance in our American history, almost all of the Franklin Battlefield has become suburban neighborhoods and small business establishments. The few parcels which remain are fast being lost to development. As you read this, the fate of this precious ground on which so many Americans fought and died is still very much in doubt. Who will ensure that these sites will not be trampled under the relentless march of economic development here in Williamson County?? Help us save more Franklin Battlefield land ! 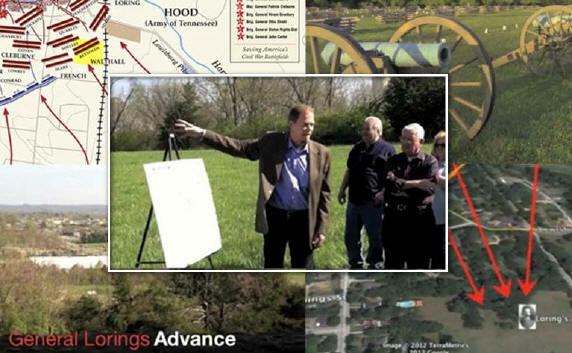 On a recent public tour of Loring's Advance, Eric Jacobson provided a stirring account of the action on this property and why saving it is so important. Click on the image below to view a video of his presentation, enhanced with maps and photographs.